Lollipops aren't just made of sugar anymore! Sure, the familiar hard candy lollipops are still a popular treat. But nowadays, lollipops can be made of anything, and this list of lollipop recipes proves it. Cake pops, chocolate lollipops, popcorn pops, and marshmallow pops are just a few of the unique lollipop recipes you'll find below. These are the candies you think of when you hear the word "lollipops." 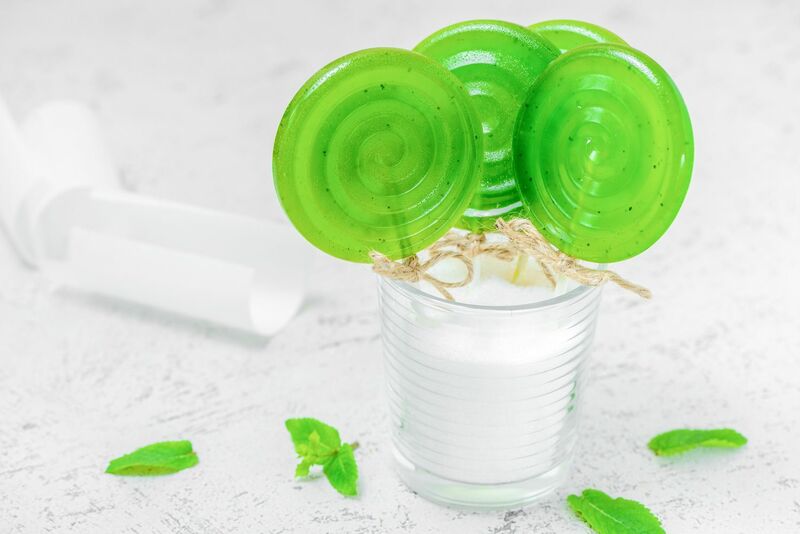 Made primarily of sugar, these hard candies can be colored and flavored to suit your tastes, so there are a seemingly infinite variety of lollipops you can make from one basic recipe. This isn't just one cake pop recipe, it's a link to a whole collection of cake pop recipes, including cheesecake pops, brownie pops, doughnut pops, and more. Learn all about making these bites of cake on a stick, and get lots of seasonal cake pop ideas. This Salted Caramel Lollipops recipe contrasts the rich flavor of caramel with a hint of salt for a sweet-and-savory treat. This is a lollipop that kids and adults alike will enjoy. Swirled Chocolate Lollipops are so simple, and so delicious. Dark chocolate is artfully drizzled over lollipop sticks and sprinkled with tasty topping for a beautiful candy that tastes as good as it looks. Funfetti Lollipops are happiness on a stick! How can you not smile when you see these cheerful cake batter-flavored lollies, sprinkled with lots of colored jimmies? I'll bet you've never seen lollipops like this before! Strawberries and Cream Lollipops are made with real strawberries, so they have a vibrant fruit taste mixed right into the sweet, vanilla-flavored candy! Vanilla Bean Lollipops prove that the simplest flavors are the best! These classic lollipops have a strong vanilla flavor and a beautiful vanilla seed-speckled appearance. Who wouldn't want to receive a bouquet of these Rose Lollipops? These beautiful rose-shaped candies are delicately scented with the fresh floral fragrance of rose water, making them the perfect gift for any romantic occasion. They're spicy! These Cinnamon Heart Pops are a sweet treat for Valentine's Day or any other romantic occasion. Marshmallow Caramel Pops are three great tastes in one easy-to-carry candy! Marshmallows are coated in a layer of caramel, then dunked in chocolate and decorated with sprinkles. Rocky Road Pops take your favorite rocky road flavors and put them on a stick! Marshmallows are skewered, then covered with chocolate and rolled in chopped nuts in this easy, kid-friendly treat. It’s popcorn on a stick! Flavorful caramel popcorn is formed into balls and served on a stick for a treat kids of all ages will enjoy. The caramel in this popcorn stays soft and chewy, so you don't have to worry about the popcorn getting too hard or crunchy on these pops. In this recipe for Balsamic Glazed Strawberries, fresh strawberries are coated with a shiny, crispy candy coating flavored with balsamic vinegar that shatters in the mouth. If you're not familiar with the combination of balsamic vinegar and strawberries, you might be surprised at how well they go together. Marbled Chocolate Heart Pops feature beautiful swirls of white and dark chocolate, molded into heart-shaped lollipops. Of course you can use this same technique with any shape of lollipop molds you have on hand, so don't feel confined to using hearts! Marshmallow Pops are a fun, whimsical candy that make great gifts or party treats. Vanilla-scented marshmallows are cut, skewered, covered with chocolate, and decorated however you like.